This is a luxury double stainless steel, quality, engraved ID Tags necklace, with engraved photos (and optional) text on the fronts (should you wish us to add a name or date etc) and personalised text on the back, the ID tags each measure approx. 23mm x 35mm x 2mm. They are made from luxury, mirror shine, stainless steel; they will not tarnish over time and make a stunning, personalised keepsake, a special keepsake that you can wear close to your heart always. This gorgeous double ID tag necklace comes complete with a 24" stainless chain already attached and ready to wear and presented in gift packaging so a perfect gift for someone special and a chunky size, perfect especially for a man. These items are engraved, not just printed onto so the engraving will not rub off; the engraving is scratched into the surface of the item and is permanent. Please note that these are not made in colour, although the image(s) can be taken from colour or black and white photos, it will still be monochrome when engraved, the engraved photos have a holographic effect, as the pictures are engraved images in the surface of the metal, this gives you a personalised gift that will be treasured for years to come. 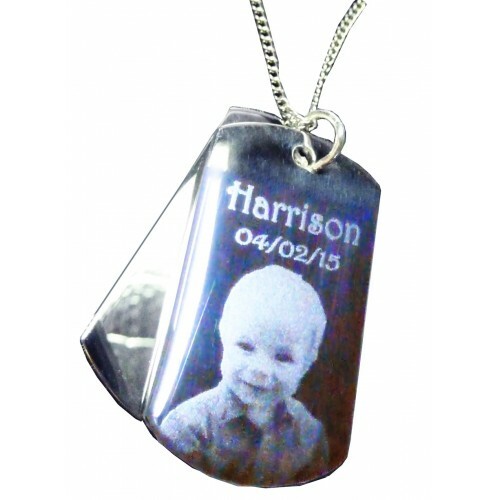 This is a very personalised keepsake as you can choose what text and photo(s) you want on your keepsake, text can be engraved alongside your photo if you wanted a name or date added for example & a personal message, or even a poem added to the reverse of the ID Tag. Please ensure that all of your text and spelling is correct and you have included any capital letters that you want included, we will just copy and paste your text so please ensure it is correct as we are unable to correct it for you. Our stunning engraved photo, double ID Tags are created by a detailed etching technique, which relies on the contrast between the light and dark areas of a photo, so the clearer the photos you have, the clearer the effect will be. When the light falls on the photo tag it gives your photo a three-dimensional holographic effect & it will look clearer in certain light than others, the image is engraved into the metal in the production of an engraved photo ID Tag. These items are normally created and dispatched within a few days of ordering and do not take very long to produce, please allow an extra couple of days at very busy times like Christmas; Father's Day & Mother's Day, but we will dispatch it as quickly as possible. We are able to offer FREE STANDARD UK MAINLAND postage for this item, for all other areas we offer a small subsidised posting charge. Please note that this time is from when we receive your photos. These are quality, personalised,,engraved present tree decorations with your photo (and optional) te.. Details This is a stainless steel, engraved photo ID tag necklace, simply upload a favourite.. Details An Engraved Photo Necklace with Oval Charm, this personalised engraved photo necklace featu.. Details An Engraved Photo Necklace with Rectangle Charm, this personalised engraved photo necklace .. Details This is a stainless steel, engraved hand print footprint, heart necklace for up to f.. Details A stainless steel, engraved hand print footprint, heart necklace for up to.. 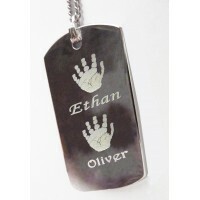 Details This is a stainless steel, Sentimental Mummy Hand Footprint ID Tag necklace, simply upload .. Details This is a stainless steel, sentimental engraved hand and/or footprint ID tag necklace, simp..